While on a ride late on the afternoon of April 26, Elisha Sir-Louis, 18, of Riverside, Iowa, took his new bike on a joy ride on a long downhill road that leads out of a cemetery on the edge of town. Before he knew it, he was bearing down on the cross street, and a pickup truck was headed in his direction. An avid mountain biker, Elisha sensed instantly that his brakes weren’t going to stop his momentum in time. Impact came seconds later. He slammed into the side of the vehicle, rolled over the hood, and was thrown nearly 30 feet as the shocked driver skillfully brought the truck to a screeching halt. Nearby, Kevin Meller of Riverside was in his garage when he heard the sickening sound of the collision. He rushed outside and saw Elisha flat on his back in the road with his head on the ground. The mangled bike was wedged under the front of the truck. “Honestly, from the sound and how far he had flown, I felt I was going to see somebody who was in bad shape,” Meller says. What he found surprised him. Elisha, while shaken up, was conscious and alert. Meller is convinced it’s because of the scuffed—but still intact—helmet on Elisha’s head. EMTs took Elisha to University of Iowa Hospitals & Clinics, where he was treated for two broken bones in his hand and some nasty scrapes. Other than that, he was fine. As a fitting reminder of the incident, the family salvaged the bike’s frame and mounted it on the wall of Elisha’s bedroom, right alongside his retired bike helmet. Pam Hoogerwerf, director of community outreach and injury prevention at UI Stead Family Children’s Hospital, is grateful the family understands how important that helmet was. Hoogerwerf and her team travel to elementary schools and public safety events around Iowa teaching younger kids to think about bike safety and prepare themselves to keep from getting injured. Hand signals, bike maintenance, and street-crossing strategies are all discussed, but the centerpiece of the session is the importance of protecting the head with a helmet. To illustrate the point, the bike safety team uses a creative demonstration in which children are encouraged to think about the similarities between an egg and the human skull. A student is then asked to drop an unprotected egg in a plastic bag on the floor and watch it crack. Next, an egg packed in a plastic container with cotton balls is dropped on the floor and remains undamaged. The team is routinely impressed by the increase in helmet use when they return to those schools later to gauge the effectiveness of the program. 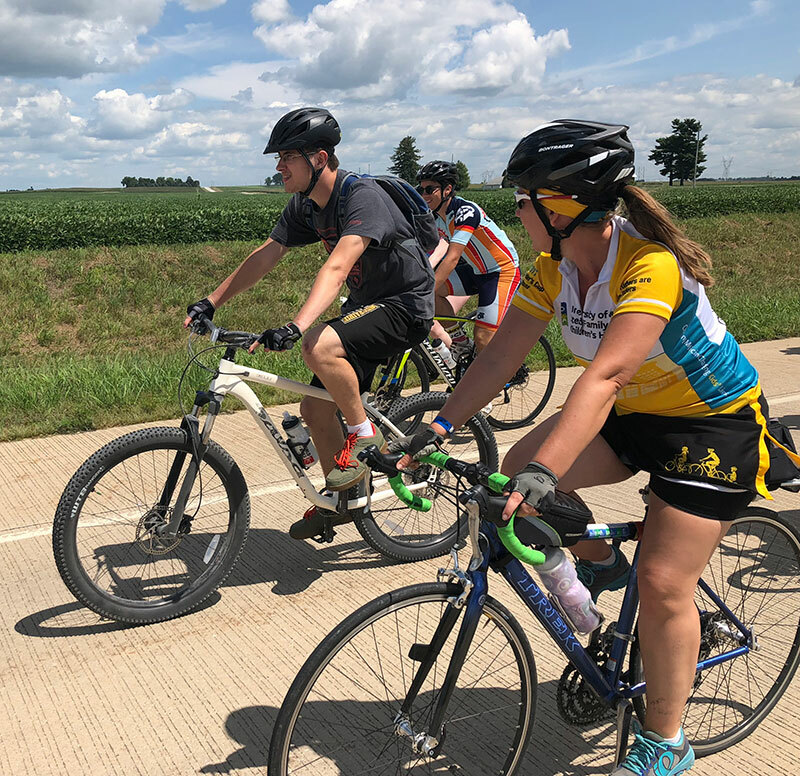 Looking to make similar strides with an adult audience, the safety team has participated in RAGBRAI every year since 2013, spreading the word about bike safety to fellow riders and other people they meet along the way. The team recently earned RAGBRAI’s Rider Cup, an award given to the group that does the best job of promoting bike safety before and during the journey. Elisha, all healed up after his accident, and his family pedaled with the team on RAGBRAI 2018 for the Hills-to-Iowa City leg on Friday, July 27. Krista is happy to have the whole family join the UI Stead Family Children’s Hospital team to help reinforce the safety messages it promotes. She knows Elisha already understood the value of safety measures like wearing a helmet and how it could benefit him in a crash like the one he had in April. But since the accident, he has also started learning the driver’s point of view. To learn more about bike safety, visit UI Stead Family Children’s Hospital’s bike safety page. Bike helmets for children and adults can be purchased through the UI Stead Family Children’s Hospital Safety Store for only $9.